This new customer traction has been facilitated through a Distribution Agreement with Thailand smart city and environmental services company E.V.F. (Thailand). SenSen and EVF are collaborating initially in Thailand to carry out two separate trials in Bangkok for the Bangkok Metropolitan Administration and the Royal Thailand Police, with the former trial currently underway. The Distribution Agreement allows for EVF to implement SenSen’s software in its clients’ operations in Thailand.EVF services infrastructure projects including office buildings, shopping centres and hospitals, and is an affiliate of Thailand construction supply company Nova Steel. EVF provides environmental services including photovoltaic, wind turbine, PV water pump, electric vehicles, as well as Smart City and Smart Grid services to the Government and airports in Thailand. The Distribution Agreement provides for SenSen to earn project revenues with EVF, with a combination of up-front system sales, software licensing and commissioning, as well as recurring Software as a Service (SaaS) and maintenance fees. As in many Asian cities, driving and parking congestion is a major problem for Bangkok. In fact, the 2017 “Unlocking Cities” survey undertaken by Uber and the Boston Consulting Jakarta, Manila, Hanoi and Kuala Lumpur. The problem has gained increasingly prominent media attention with multiple recent investigations from the Bangkok Post highlighting the city’s crowded roads. The two initial trials in Bangkok will utilise SenSen’s Gemineye technology to analyse Thai motor vehicle and motorcycle licence plates to detect illegal driving on footpaths and enforce regulation to minimise associated accidents and fatalities. As announced to the ASX on 12 March 2019, Gemineye is the world’s first AI-powered smartphone app offering governments, councils and cities worldwide an affordable, highly accurate, cloud-based smart city platform to deliver a range of infrastructure monitoring services for road safety and civic compliance applications. Trial 1, with the Bangkok Metropolitan Administration, has been running since February and harnesses SenSen’s Gemineye solution to help address the unsafe motorcycles-on-footpath issues in Bangkok. As noted in the media reports referenced above, a number of recent incidents have occurred to schoolgirls and pedestrians. SenSen’s ability to read motorcycles’ licence plates (which is complex in Thailand as they vary in design, dimension and colour, and involve different Thai language characters), as well as identify riders without helmets, will empower Thai authorities to accurately prosecute offenders and thereby reduce the incidence of such offences. Trial 2, with the Royal Thailand Police, involves CCTV monitoring of merging lanes at one location jn Bangkok. SenSen is capturing and processing offences through the Company’s Back Office System (“SenBOS”) for offence verification and collaboration of data with name and address details from the Land Transport Department. This trial will commence this month and is expected to run over one month. “We are delighted to be working with EVF in Thailand deploying our Gemineye solution to help save lives and reduce congestion in our first Asian country so soon after we formally launched the product in March. “While we launched the Gemineye smartphone based smart city platform targeting parking enforcement and real-time illegal dumping detection, we are delighted to note the initiatives from EVF that are exploiting the platform capabilities of Gemineye to solve the specific pain points of Bangkok. “This trial in Thailand has enabled SenSen to demonstrate a new application for Gemineye, and one which can be employed throughout heavily congested Asian cities, to assist in providing a safer pedestrian environment for citizens. “We believe our AI-powered smartphone app will deliver the Thai Government a highly accurate and affordable solution that will ultimately make Bangkok roads safer and save lives. 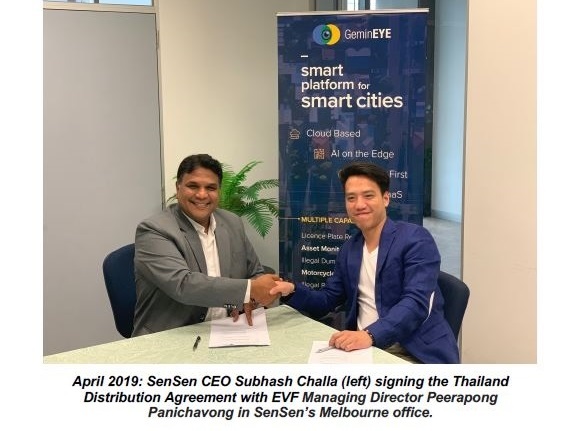 It is anticipated that upon successful completion of this trial, SenSen and EVF will commence the roll-out of the project across a number of sites in Bangkok. “We are very excited to be partnering with SenSen. 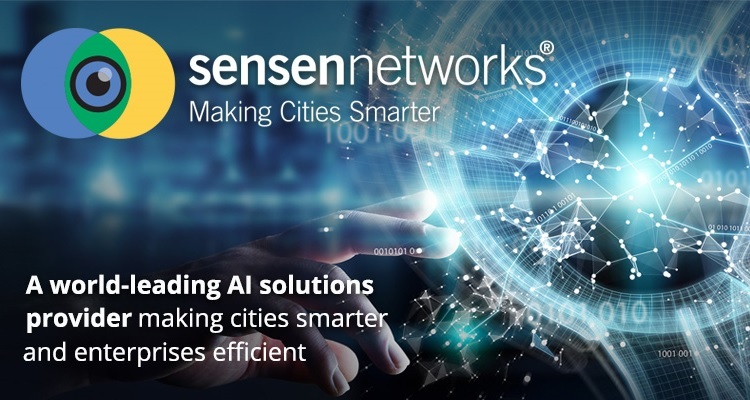 Like us, the team at SenSen is focused on improving the community by making cities smarter and businesses more productive in an environmentally responsible manner. “SenSen’s Gemineye technology has provided extremely accurate evidence of illegal motorcycle riding on Bangkok footpaths in the trial, and we expect to start installing the solution across the city in the coming months.